Prefer to Get Started Now? Complete the following information and we will be in contact with you promptly. Rockwool Insulation in Riverside, Ca. Doing the job correctly and efficiently is personal for us. We are creative problem-solvers and critical thinkers with deep technical expertise and attention to detail; we catch issues before they become problems, not after. Homeowners in Riverside looking to insulate (or re-insulate) their homes are encouraged to ask us for an instant quote. Whether you need air-sealing in your attic, installation of new attic insulation, radiant barrier products, or replacement of your old garage door with an attractive, brand new sealed one, one of our home specialists in Riverside will be happy to assist you in diagnosing your needs. We know your time is valuable, and we don’t make appointments without your approval. Most of all, we are committed to getting the work done right the first time, and if issues arise, we will correct them immediately. We proudly offer free inspections in Riverside, and promise to work strictly within YOUR budget—you can rest assured there will be no surprise fees. Plus, the more you insulate, the more energy efficient your house will be, thus saving your wallet and the planet. Give us a call to set up a free, no obligation appointment to see if home insulation is right for you and we’ll send over a residential contractor. Riverside, Ca. residents have relied on home insulation services Alcal Home Services Division for more than 40 years, and we’d love for you to join them! Batt insulation is fiberglass blanket insulation that comes in rolls or sheets and designed for easy handling. It is used between framing such as studs and joists. Unfaced batt insulation can also be used on exterior walls when a vapor barrier is added on the heated side of the wall. Kraft or faced batt insulation serves as friction between studs and are held in place without stapling. Batt rolls are available in a variety of lengths, widths, and R-values. Spray polyurethane foam (SPF) is a spray-applied plastic that can form a continuous insulation and air-sealing barrier on walls, roofs, around corners, and on all contoured surfaces. Spray Foam insulation is known to resist heat transfer extremely well and offers a highly effective solution for reducing unwanted air infiltration through cracks, seams, and joints. Our closed-cell spray foams provide a higher R-value per inch than less expensive insulation types like fiberglass, cellulose, or open-cell foam, all of which have R-values of R-3.2 to R-3.8 per in. The low density of open-cell spray foam makes it relatively vapor permeable (a 3-in.-thick layer of open-cell foam has a permeance of 16), so when it’s used to create an unvented conditioned attic in a cold climate, the interior face of the foam should be covered with a vapor retarder. Radiant Barrier Foil insulation is a layer of metalized film facing an airspace and is installed in the envelope of a building. Radiant barrier insulation or Reflectix is a reflective insulation system that reflects radiant heat energy instead of absorbing it. Green Building Materials reduces the amount of energy you use in your home helps to reduce the amount of greenhouse gas that is emitted into the atmosphere. Adding insulation and air sealing to your home can dramatically reduce the amount of energy used when heating and cooling your home. This will reduce your carbon footprint, and also reduce the amount of chemicals released into the environment from air conditioning units. Owens Corning is doing its part in keeping the world green, by providing us with safe recycled insulation products that we can use to reduce the amount of energy that your home consumes. The Owens Corning products that Alcal uses are certified by the GreenGuard indoor air quality (IAQ) program and are safe for your home. These products are tested for more than 2,000 volatile organic compounds (VOC’s), and emit the Lowest and safest possible levels of VOC’s into your home. Rockwool insulation is made from rock, blast furnace slag, and other raw materials which are melted and spun into fibers to resemble the texture of wool. Mineral wool comes in batts rolls or loose-fill forms. Like fiberglass, it is also used throughout a house in sidewalls, attics, floors, crawl spaces, cathedral ceilings, and basements. Alcal provides professional and clean insulation removal services. We recommend removing old insulation only when it has fire damage, water damage, or is heavily infested with rodents. What type of insulation is right for your home or project? As experts in installing insulation, Alcal Home Services Division is here to assist you in evaluating the various options to achieve the best energy saving results for your home. Whether you’re adding insulation to your attic, finishing a basement, building an addition, modifying an under-insulated bonus room, or adding acoustic insulation for sound control, we have the right products to meet your needs and stay within your budget. We are committed to aligning ourselves with the very best product suppliers in the industry, suppliers that are well aligned with our culture of honesty, integrity, and accountability. We have long-standing strong relationships with the industry's leading suppliers of insulation in Riverside. A garage door is an important part of the exterior of your property. In addition to providing curb appeal, it also contributes to the overall security and energy efficiency of your home. As the leading garage door installers in Riverside, CA, The certified employees at Alcal will guarantee your garage door is installed properly. A door that is improperly installed may not function properly or even pose a safety risk. Not only will this bring up the expense of maintenance and emergency repairs, but it's obvious why working with a company like Alcal that offers a garage door installation warranty is important. Alcal’s courteous and friendly service technicians have been professionally trained and thoroughly screened through background checks. 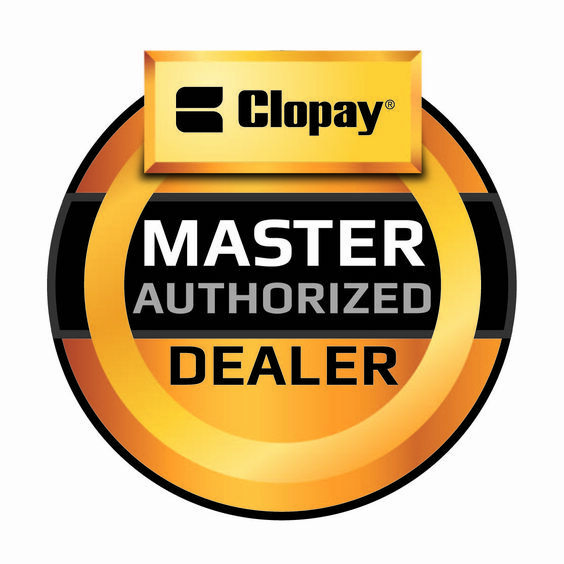 Because of our service and expertise, we have earned the Clopay Master Authorized dealer and LiftMaster ProVantage Certified Dealer designations. With an extensive variety of styles, colors, and performance options, Alcal makes it easy to find the perfect garage door to fit your home and budget. Increase your curb appeal and upgrade your house with Alcal’s garage doors made from durable, energy efficient materials. Whether you choose natural wood or steel carriage house doors from Clopay’s Reserve®, Coachman®, Gallery® or Grand Harbor Collections, as a certified master dealer, Alcal has the experience and expertise to help transform your home. Adding garage doors provide a dramatic difference in your home’s appearance. When neighbors pass by, when guests pull up, or when you return from work, your house will have a distinct beauty that makes it the focal point of your neighborhood. As a Clopay Master Authorized dealer in Riverside, Alcal is recognized as a market leader, both locally and throughout Clopay’s dealer network. Here at Alcal we are dedicated to providing superior levels of professional expertise and responsiveness in sales, installation, and service. Alcal has the prestigious honor of being one of Liftmaster Provantage Dealers. By being a LiftMaster® ProVantage Dealer, Alcal is credited as a full-service dealer that is recognized for premier sales and installation levels of LiftMaster products. By being an indicated LiftMaster Dealer in Riverside, Alcal has completed safety training for compliance with the UL 325 safety standards for Garage Door Openers and Commercial Door Operators. These standards include basic qualifying factors with which products must comply in order to be listed and labeling program, methods for testing products safely, covers installation of these products under the National Electrical Code, and addresses fire and electrical safety of the product and the installer. With this extensive training, you can depend on us to have the training to understand how to test your systems safely and determine the solutions you need. Let the certified technicians at Alcal assist you with are your garage door questions. Call us today on our toll-free line at (951) 651-0329 to speak with the garage door experts in Riverside, CA.